The results are in from the first Briefcase Coach Linkedin's Choice Award for the best recruiter. The contest went "viral" and job seekers (or former job seekers) from all over the world weighed in on their favorite recruiter. The competition was stiff this year and the criteria set the bar high. What constitutes a good recruiter? * They are great at networking because they truly care about people. * They act with integrity. Always. * They know their industry. * They know how to market you for the right positions. They've earned the trust of hiring managers--and they value their feedback. * They are organized. You are never confused about the next step or have to re-do paperwork. * They follow through. You always know where you stand in the process. Tabitha has developed the LinkedIn reputation for being "America's Recruiting Sweetheart". I got comments, likes and private messages from job seekers telling me how she constantly goes above and beyond and always offers help when able. One connection wrote, " Tabitha is helping me in finding work, but her cheerful demeanor and the personal way in which she interacts with me makes me feel special". I know Tabitha on a personal level and know her to be genuine, compassionate and someone who takes the time to advocate and support others. Tabitha's recruiting specialty is gaming and technology. What do you do with a list like this? The recruiters above have a reputation for being ethical and candidate-friendly. These are people you should absolutely take the time to FOLLOW on Linkedin. Some of the recruiters on the list may be willing to accept a connection request. You could send a message like this, "I saw your name on the Briefcase Coach's list of top recruiters. 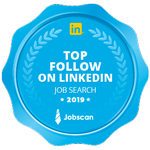 I am looking to expand my network and would love to be connected with a candidate friendly recruiter". Engage with these recruiters on their discussions and status updates. But DON’T STALK! If they post a job, share it with your network. Working with a recruiter can be a two-way street and by helping them, they are more likely to feel inclined to help you in return. Think about how can you make their jobs and their lives easier. If you know someone who may be suitable for a role that they are working on, make recommendations. Hi I'm an aeronautical engineer. I have 2-year experience as quality service assistant. I'm looking for my next job .can you help me to find that? Before you send a message to a recruiter, know their industry. If they are an IT and gaming recruiter, they will not have jobs in the healthcare space.